Ultraviolet (UV) light is electromagnetic radiation with a wavelength shorter than that of visible light, but longer than soft X-rays. The name means "beyond violet"—ultra is the Latin word for "beyond", and violet is the color of the shortest wavelengths of visible light. Some UV wavelengths are colloquially called black light, as it is invisible to the human eye. Some animals, including birds, reptiles, and insects such as bees, can see into a portion of the ultraviolet region (the "near ultraviolet" region). Many fruits, flowers, and seeds stand out more strongly from the background in ultraviolet wavelengths as compared to human color vision. Scorpions glow or take on a yellow to green color under UV illumination. Many birds have patterns in their plumage that are invisible at usual wavelengths but observable in ultraviolet, and the urine of some animals is much easier to spot with ultraviolet. The discovery of UV radiation was intimately associated with the observation that silver salts darken when exposed to sunlight. In 1801 German physicist Johann Wilhelm Ritter made the hallmark observation that invisible rays just beyond the violet end of the visible spectrum were especially effective at darkening paper soaked in silver chloride. He called them "deoxidizing rays" to indicate their chemical reactivity and to distinguish them from "heat rays" at the other end of the visible spectrum. The simpler term "chemical rays" was adopted shortly thereafter, and it remained popular throughout the nineteenth century. The terms chemical rays and heat rays were eventually dropped in favor of ultraviolet and infrared radiation, respectively. Ultraviolet radiation may be subdivided into three regions: near UV (NUV; wavelength range of 380–200 nanometers), far or vacuum UV (FUV or VUV; 200–10 nm), and extreme UV (EUV or XUV; 1–31 nm). When considering the effect of UV radiation on human health and the environment, the range of UV wavelengths is often subdivided into UVA (400–315 nm), also called Long Wave or "blacklight"; UVB (315–280 nm), also called Medium Wave; and UVC (below 280 nm), also called Short Wave or "germicidal". In photolithography, laser technology, and similar technologies, the term deep ultraviolet (DUV) refers to wavelengths below 300 nm. The Sun emits ultraviolet radiation in the UVA, UVB, and UVC bands, but because of absorption in the atmosphere's ozone layer, 99 percent of the ultraviolet radiation that reaches the Earth's surface is UVA. Some of the UVC light is responsible for the generation of the ozone. Ordinary glass is partially transparent to UVA but is opaque to shorter wavelengths, while Silica or quartz glass, depending on quality, can be transparent even to vacuum UV wavelengths. Ordinary window glass passes about 90 percent of the light above 350 nm (nanometer, one billionth of a meter), but blocks over 90 percent of the light below 300 nm. The onset of vacuum UV, 200 nanometers, is defined by the fact that ordinary air is opaque below this wavelength. This opacity is due to the strong absorption of light of these wavelengths by oxygen in the air. Pure nitrogen (less than about 10 parts per million oxygen) is transparent to wavelengths in the range of about 150–200 nanometers. This has wide practical significance now that semiconductor manufacturing processes are using wavelengths shorter than 200 nanometers. By working in oxygen-free gas, the equipment does not have to be built to withstand the pressure differences required to work in a vacuum. Extreme UV (EUV) is characterized by a transition in the physics of interaction with matter: wavelengths longer than about 30 nanometers interact mainly with the valence electrons (electrons on the outermost shell of an atom) of matter, while wavelengths shorter than that interact mainly with inner shell electrons and nuclei. EUV is strongly absorbed by most known materials, but it is possible to synthesize multilayer optics that reflect up to about 50 percent of XUV radiation at normal incidence. This technology has been used to make telescopes for solar imaging; it was pioneered by the Normal Incidence X-Ray Telescope (NIXT) and Multi Spectral Telescope Array (MSSTA) sounding rockets in the 1990s; (current examples are SOHO/EIT and TRACE) and for nanolithography (printing of traces and devices on microchips). A positive effect of UVB light is that it induces the production of vitamin D in the skin. It has been estimated that tens of thousands of premature deaths occur in the US annually from a range of cancers due to insufficient UVB exposure (via vitamin D deficiency). Another effect of vitamin D deficiency is osteomalacia (rickets), which can result in bone pain, difficulty in weight bearing and sometimes fractures. Ultraviolet radiation has other medical applications, in the treatment of skin conditions such as psoriasis and vitiligo. UVB and UVA radiation can be used, in conjunction with psoralens (PUVA) treatment. In cases of psoriasis and vitiligo UV light with wavelength of 311 nanometers is most effective. In humans, prolonged exposure to solar UV radiation may result in acute and chronic health effects on the skin, eye, and immune system. UVC rays are the highest energy, most dangerous type of ultraviolet light. Little attention has been given to UVC rays in the past since they are filtered out by the atmosphere. However, their use in equipment such as pond sterilization units may pose an exposure risk, if the lamp is switched on outside of its enclosed pond sterilization unit. Ultraviolet photons harm the DNA molecules of living organisms in different ways. In one common damage event, adjacent bases bond with each other, instead of across the "ladder". This makes a bulge, and the distorted DNA molecule does not function properly. Prolonged exposure to UVA, UVB and UVC can all damage collagen fibers and thereby accelerate aging of the skin. In general, UVA is the least harmful, but can contribute to the aging of skin, DNA damage and possibly skin cancer. It penetrates deeply and does not cause sunburn. Because it does not cause reddening of the skin (erythema) it cannot be measured in the sun protection factor testing. There is no good clinical measurement of the blocking of UVA radiation, but it is important that sunscreen block both UVA and UVB. UVA light is also known as "black light" and, because of its longer wavelength, can penetrate many windows. It also penetrates deeper into the skin than UVB light and is thought to be a prime cause of wrinkles. UVB light can cause skin cancer (if there is prolonged exposure). The radiation excites DNA molecules in skin cells, causing covalent bonds to form between adjacent thymine bases, producing thymidine dimers. Thymidine dimers do not base pair normally, which can cause distortion of the DNA helix, stalled replication, gaps, and misincorporation. These can lead to mutations, which can result in cancerous growths. The mutagenicity of UV radiation can be easily observed in bacteria cultures. This cancer connection is one reason for concern about ozone depletion and the ozone hole. As a defense against UV radiation, the body tans when exposed to moderate (depending on skin type) levels of radiation by releasing the brown pigment melanin. This helps to block UV penetration and prevent damage to the vulnerable skin tissues deeper down. Suntan lotion that partly blocks UV is widely available (often referred to as "sun block" or "sunscreen"). Most of these products contain an "SPF rating" that describes the amount of protection given. This protection, however, applies only to UVB rays responsible for sunburn and not to UVA rays that penetrate more deeply into the skin and may also be responsible for causing cancer and wrinkles. Some sunscreen lotion now includes compounds such as titanium dioxide which helps protect against UVA rays. Other UVA blocking compounds found in sunscreen include zinc oxide and avobenzone. There are also naturally occurring compounds found in rainforest plants that have been known to protect the skin from UV radiation damage, such as the fern Phlebodium aureum. Another means to block UV is sun protective clothing. This is clothing that has a "UPF rating" that describes the protection given against both UVA and UVB. High intensities of UVB light are hazardous to the eyes, and exposure can cause welder's flash (photokeratitis or arc eye) and may lead to cataracts, pterygium, and pinguecula formation. Ordinary, untreated eyeglasses give some protection. Most plastic lenses give more protection than glass lenses, because, as noted above, glass is transparent to UVA and the common acrylic plastic used for lenses is less so. Some plastic lens materials, such as polycarbonate, inherently block most UV. There are protective treatments available for eyeglass lenses that need it which will give better protection. But even a treatment that completely blocks UV will not protect the eye from light that arrives around the lens. To convince yourself of the potential dangers of stray UV light, cover your lenses with something opaque, like aluminum foil, stand next to a bright light, and consider how much light you see, despite the complete blockage of the lenses. Most intraocular lenses help to protect the retina by absorbing UV radiation. A black light is a lamp that emits long wave UV radiation and very little visible light. Fluorescent black lights are typically made in the same fashion as normal fluorescent lights except that only one phosphor is used and the normally clear glass envelope of the bulb is replaced by a deep bluish purple glass called Wood's glass. To thwart counterfeiters, sensitive documents (e.g. credit cards, driver's licenses, passports) may also include a UV watermark that can only be seen when viewed under a UV-emitting light. Passports issued by most countries usually contain UV sensitive inks and security threads. Visa stamps and stickers such as those issued by Ukraine contain large and detailed seals invisible to the naked eye under normal lights, but strongly visible under UV illimunation. Passports issued by the United States have the UV sensitive threads on the last page of the passport along with the barcode. Fluorescent lamps produce UV radiation by ionising low-pressure mercury vapour. A phosphorescent coating on the inside of the tubes absorbs the UV and converts it to visible light. The main mercury emission wavelength is in the UVC range. Unshielded exposure of the skin or eyes to mercury arc lamps that do not have a conversion phosphor is quite dangerous. Other practical UV sources with more continuous emission spectra include xenon arc lamps (commonly used as sunlight simulators), deuterium arc lamps, mercury-xenon arc lamps, metal-halide arc lamps, and tungsten-halogen incandescent lamps. In astronomy, very hot objects preferentially emit UV radiation (see Wien's law). However, the same ozone layer that protects us causes difficulties for astronomers observing from the Earth, so most UV observations are made from space. Ultraviolet fly traps are used for the elimination of various small flying insects. They are attracted to the UV light and are killed using an electrical shock or trapped once they come into contact with the device. UV/VIS spectroscopy is widely used as a technique in chemistry, for analysis of chemical structure, most notably conjugated systems (a system of atoms with alternating single and double covalent bonds). UV radiation is often used in visible spectrophotometry to determine the existence of fluorescence in a given sample. 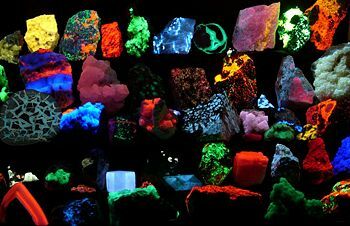 Ultraviolet lamps are also used in analyzing minerals, gems, and in other detective work including authentication of various collectibles. Materials may look the same under visible light, but fluoresce to different degrees under ultraviolet light; or may fluoresce differently under short wave ultraviolet versus long wave ultraviolet. UV fluorescent dyes are used in many applications (for example, biochemistry and forensics). The fluorescent protein Green Fluorescent Protein (GFP) is often used in genetics as a marker. Many substances, proteins for instance, have significant light absorption bands in the ultraviolet that are of use and interest in biochemistry and related fields. UV-capable spectrophotometers are common in such laboratories. Ultraviolet radiation is used for very fine resolution photolithography, a procedure where a chemical known as a photoresist is exposed to UV radiation which has passed through a mask. The light allows chemical reactions to take place in the photoresist, and after development (a step that either removes the exposed or unexposed photoresist), a geometric pattern which is determined by the mask remains on the sample. Further steps may then be taken to "etch" away parts of the sample with no photoresist remaining. A new application of UV is to detect corona discharge (often simply called "corona") on electrical apparatus. Degradation of insulation of electrical apparatus or pollution causes corona, wherein a strong electric field ionizes the air and excites nitrogen molecules, causing the emission of ultraviolet radiation. Corona produces ozone and to a lesser extent nitrogen oxide which may subsequently react with water in the air to form nitrous acid and nitric acid vapour in the surrounding air. Ultraviolet lamps are used to sterilize workspaces and tools used in biology laboratories and medical facilities. Commercially-available low pressure mercury-vapor lamps emit about 86 percent of their light at 254 nanometers, which coincides very well with one of the two peaks of the germicidal effectiveness curve (i.e., effectiveness of UV absorption by DNA). One of these peaks is at about 265 nanometers and the other is at about 185 nanometers. Although 185 nanometers is better absorbed by DNA, the quartz glass used in commercially-available lamps, as well as environmental media such as water, are more opaque to 185 nanometers than 254 nanometers. UV light at these germicidal wavelengths causes adjacent thymine molecules on DNA to dimerize, if enough of these defects accumulate on a microorganism's DNA its replication is inhibited, thereby rendering it harmless (even though the organism may not be killed outright). 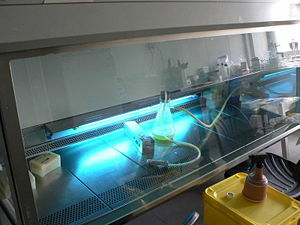 Since microorganisms can be shielded from ultraviolet light in small cracks and other shaded areas, however, these lamps are used only as a supplement to other sterilization techniques. UV radiation can be an effective viricide and bactericide. Disinfection using UV radiation was more commonly used in wastewater treatment applications but is finding increased usage in drinking water treatment. A process named SODIS  has been extensively researched in Switzerland and proven ideal to treat small quantities of water. Contaminated water is filled into transparent plastic bottles and exposed to full sunlight for six hours. The sunlight is treating the contaminated water through two synergetic mechanisms: Radiation in the spectrum of UV-A (wavelength 320-400 nanometers) and increased water temperature. If the water temperatures raises above 50 °C, the disinfection process is three times faster. It used to be thought that UV disinfection was more effective for bacteria and viruses, which have more exposed genetic material, than for larger pathogens which have outer coatings or that form cyst states (e.g., Giardia) that shield their DNA from the UV light. However, it was recently discovered that ultraviolet radiation can be somewhat effective for treating the microorganism cryptosporidium. The findings resulted in two U.S. patents and the use of UV radiation as a viable method to treat drinking water. Giardia, in turn, has been shown to be very susceptible to UVC when the tests were based on infectivity rather than excystation. It turns out that protists are able to survive high UVC doses but are sterilized at low doses. As consumer demand for fresh and "fresh like" food products increases, the demand for nonthermal methods of food processing]] is likewise on the rise. In addition, public awareness regarding the dangers of food poisoning is also raising the demand for improved food processing methods. Ultraviolet radiation is used in several food processes to remove unwanted microorganisms. UV light can be used to pasteurize fruit juices by flowing the juice over a high intensity ultraviolet light source. The effectiveness of such a process depends on the UV absorbance of the juice. Ultraviolet detectors generally use either a solid-state device, such as one based on silicon carbide or aluminum nitride, or a gas-filled tube as the sensing element. UV detectors which are sensitive to UV light in any part of the spectrum respond to irradiation by sunlight and artificial light. A burning hydrogen flame, for instance, radiates strongly in the 185 to 260 nanometer range and only very weakly in the infrared (IR) region, while a coal fire emits very weakly in the UV band yet very strongly at IR wavelengths; thus a fire detector which operates using both UV and IR detectors is more reliable than one with a UV detector alone. Virtually all fires emit some radiation in the UVB band, while the Sun's radiation at this band is absorbed by the Earth's atmosphere. The result is that the UV detector is "solar blind," meaning it will not cause an alarm in response to radiation from the Sun, so it can easily be used both indoors and outdoors. UV detectors are sensitive to most fires, including hydrocarbons, metals, sulfur, hydrogen, hydrazine, and ammonia. Arc welding, electrical arcs, lightning, X-rays used in nondestructive metal testing equipment (though this is highly unlikely), and radioactive materials can produce levels that will activate a UV detection system. The presence of UV-absorbing gases and vapors will attenuate the UV radiation from a fire, adversely affecting the ability of the detector to detect flames. Likewise, the presence of an oil mist in the air or an oil film on the detector window will have the same effect. Certain inks, coatings, and adhesives are formulated with photoinitiators (ingredient that absorbs light) and resins. When exposed to the correct energy and irradiance in the required band of UV light, polymerisation occurs, and so the adhesives harden or cure. Usually, this reaction is very quick, a matter of a few seconds. Applications include glass and plastic bonding, optical fiber coatings, the coating of flooring, paper finishes in offset printing, and dental fillings. An industry has developed around the manufacture of UV sources for UV curing applictions. Fast processes such as flexo or offset printing require high intensity light focused via reflectors onto a moving substrate and medium and high pressure mercury- or iron-based bulbs can be energised with electric arc or microwaves. Lower power fluorescent lamps can be used for static applications and in some cases, small high pressure lamps can have light focussed and transmitted to the work area via liquid filled or fibre optic light guides. UV lights have been installed in some parts of the world in public restroom and on public transport for the purpose of deterring substance abuse. The blue color of these lights, combined with the fluorescence of the skin, make it harder for intravenous drug users to find a vein. The efficacy of these lights for that purpose has been questioned, with some suggesting that drug users simply find a vein outside the public restroom and mark the spot with a marker for accessibility when inside the restroom. There is currently no published evidence supporting the idea of a deterrent effect. Some EPROM (electronically programmable read-only memory) modules are erased by exposure to UV radiation. These modules often have a transparent glass (quartz) window on the top of the chip that allows the UV radiation in. These have been largely superseded by EEPROM and flash memory chips in most devices. UV radiation is useful in preparing low surface energy polymers for adhesives. Polymers exposed to UV light will oxidize thus raising the surface energy of the polymer. Once the surface energy of the polymer has been raised, the bond between the adhesive and the polymer will be greater. Using multi-spectral imaging it is possible to read illegible papyruses, such as the burned papyruses of the Villa of the Papyri or of Oxyrhynchus. 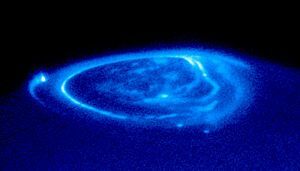 The technique involves taking pictures of the illegible papyruses using different filters in the infrared or ultraviolet range, finely tuned to capture certain wavelengths of light. Thus, the optimum spectral portion can be found for distinguishing ink from paper on the papyrus surface. ↑ Soda Lime Glass Transmission Curve. ↑ B270-Superwite Glass Transmission Curve. ↑ Selected Float Glass Transmission Curve. ↑ Grant, W. B. (2002). "An estimate of premature cancer mortality in the U.S. due to inadequate doses of solar ultraviolet-B radiation". 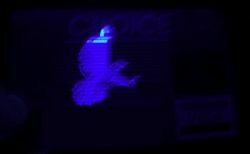 Cancer Volume 94, Issue 6, pp. 1867-1875. ↑ Health effects of UV radiation. ↑ Matsumura, Y. and H. N. Ananthaswamy. (2004). "Toxic effects of ultraviolet radiation on the skin." Toxicology and Applied Pharmacology 195 (3): 298-308. ↑ Nolan, T. M. et al. (2003). "The Role of Ultraviolet Irradiation and Heparin-Binding Epidermal Growth Factor-Like Growth Factor in the Pathogenesis of Pterygium." American Journal of Pathology. ↑ Di Girolamo, N. et al. (2005). "Epidermal Growth Factor Receptor Signaling is Partially Responsible for the Increased Matrix Metalloproteinase-1 Expression in Ocular Epithelial Cells after UVB Radiation." American Journal of Pathology. ↑ Corona - The Daytime UV Inspection Magazine. ↑ Ware, M. W. et al.. "Inactivation of Giardia muris by Low Pressure Ultraviolet Light". United States Environmental Protection Agency. Hu S, et. al. 2004. "UV Radiation and Melanoma in US Hispanics & Blacks.". Arch Dermatol. 140 (7): 819-824. Hockberger, P.E. 2002. "A History of Ultraviolet Photobiology for Humans, Animals and Microorganisms." Photochemistry and Photobiology 76 (6): 561-579. Grant, W. B. 2002. "An estimate of premature cancer mortality in the U.S. due to inadequate doses of solar ultraviolet-B radiation." Cancer 94 (6): 1867-1875. Nolan, T. M. et al. 2003. "The Role of Ultraviolet Irradiation and Heparin-Binding Epidermal Growth Factor-Like Growth Factor in the Pathogenesis of Pterygium." American Journal of Pathology 162: 567-574. Di Girolamo, N. et al. 2005. "Epidermal Growth Factor Receptor Signaling Is Partially Responsible for the Increased Matrix Metalloproteinase-1 Expression in Ocular Epithelial Cells after UVB Radiation." American Journal of Pathology 167: 489-503. Ware, M. W. et al. 2006. "Inactivation of Giardia muris by Low Pressure Ultraviolet Light." United States Environmental Protection Agency. Retrieved January 8, 2007. Matsumura, Y. & H. N. Ananthaswamy. 2004. "Toxic effects of ultraviolet radiation on the skin." Toxicology and Applied Pharmacology 195 (3): 298-308. Radiation Curing Center. 2007. Photoinitiators. SpecialChem S. A. Retrieved January 8, 2007. This page was last modified on 29 August 2008, at 15:58.